Junior Rugby has once again ended for the year, after a very successful season. 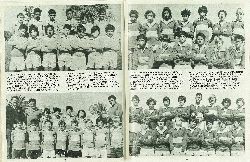 Highlight for the boys, of course, was the final day s games and the presentation of cups to winning teams. This was followed by the usual "shout" of soft drinks and eats. 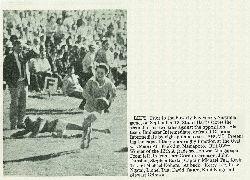 Prior to the Poverty Bay versus Australia game, on September 12, Stuart Harris scores the second of his two tries against the opposition. His team, Ilminster Intermediate, defeated Gisborne Intermediate by eight points to six. 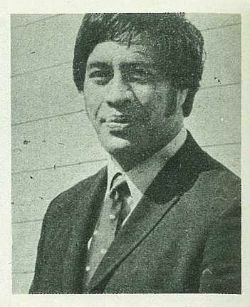 Presenting the cups at the junior rugby function at the Oval was Maori All Black Jim Maniapoto. Winner of the 13th A grade section was Mangapapa. From left, in front, are Gordon Grimson, John Dunstan, Stephen Burke, Captain Michael Tua, Kevin Tu and Michael Kohere. 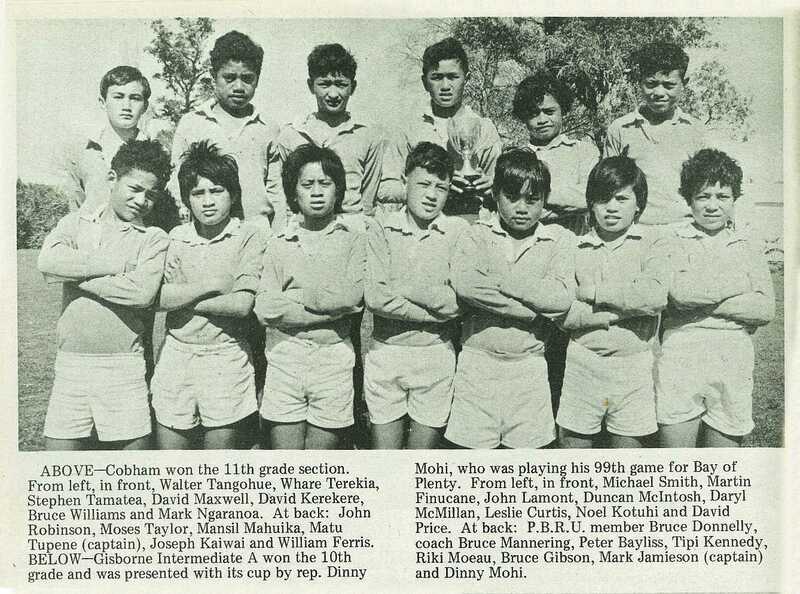 At back: Kerry Lee, Isaac Ngatai, Lionel Tua, David Tatare, Kohi Kingi and Stewart Grimson. The 13th B grade winner was Te Wharau. This team is, from left, in front, Brent Beattie, Phillip Carswell, John Smith, David MacKintosh and James Takoko. 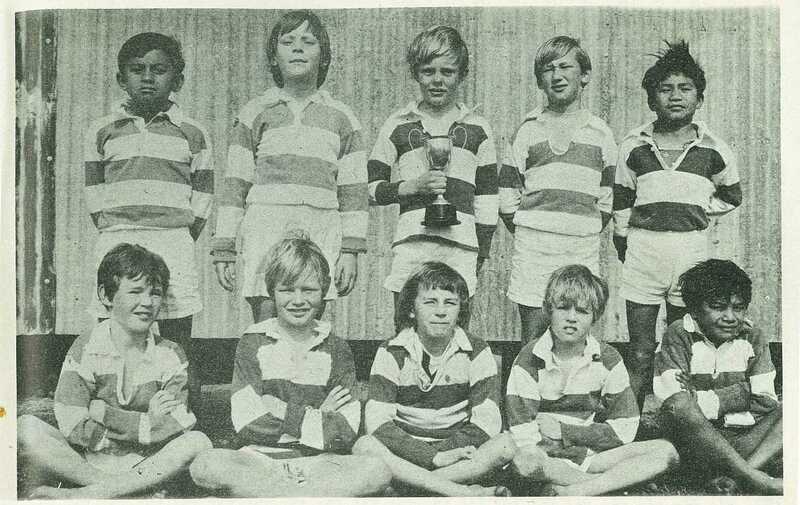 At back: Prince Tupara, Andrew Sleeman, Scott Bramwell (captain), Phil Wilcox and Phillip Turei. Taking the 12th grade section was Te Wharau, also. 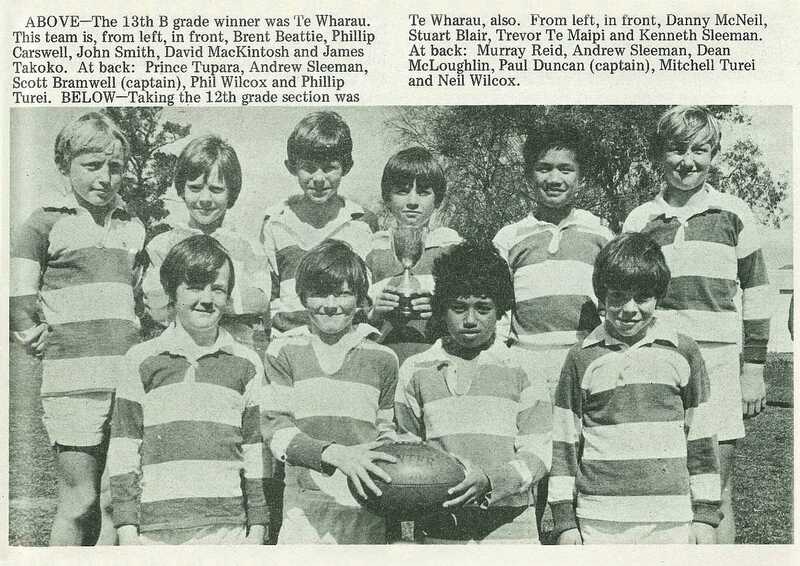 From left, in front, Danny McNeil, Stuart Blair, Trevor Te Maipi and Kenneth Sleeman. 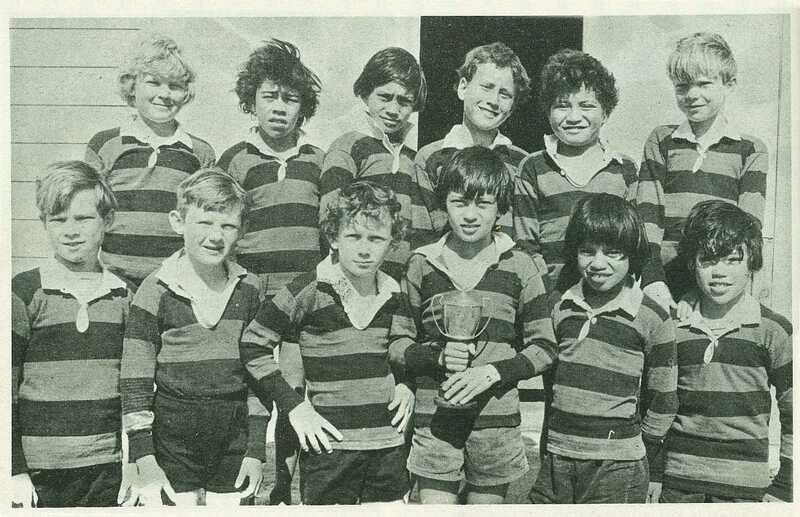 At back: Murray Reid, Andrew Sleeman, Dean McLoughlin, Paul Duncan (captain), Mitchell Turei and Neil Wilcox. Cobham won the 11th grade section. 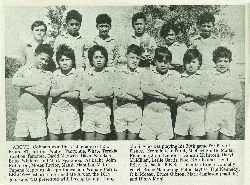 From left, in front, Walter Tangohue, Whare Terekia, Stephen Tamatea, David Maxwell, David Kerekere, Bruce Williams and Mark Ngaranoa. 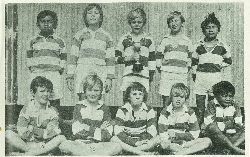 At back: John Robinson, Moses Taylor, Mansil Mahuika, Matu Tupene (captain), Joseph Kaiwai and William Ferris. 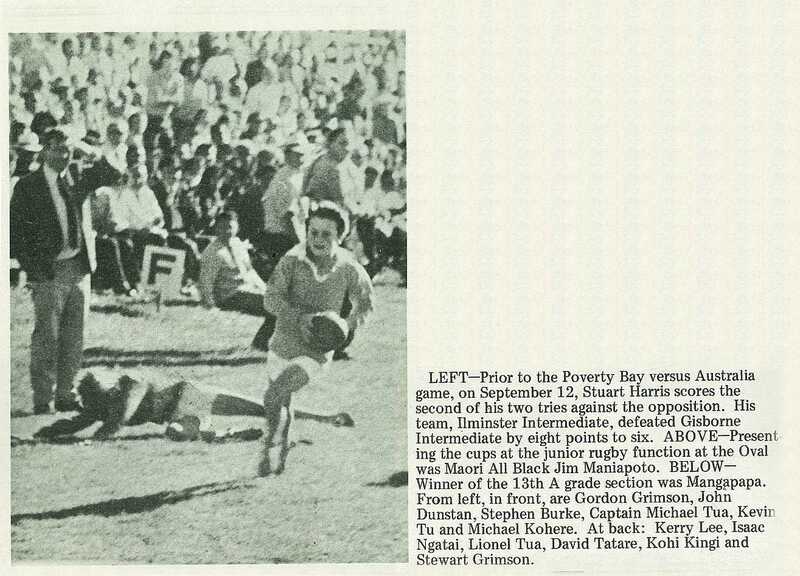 Gisborne Intermediate A won the 10th grade and was presented with its cup by rep. Dinny Mohi, who was playing his 99th game for Bay of Plenty. 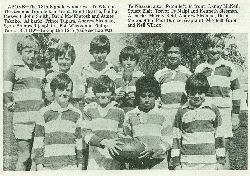 From left, in front, Michael Smith, Martin Finucane, John Lamont, Duncan Mcintosh, Daryl McMillan, Leslie Curtis, Noel Kotuhi and David Price. 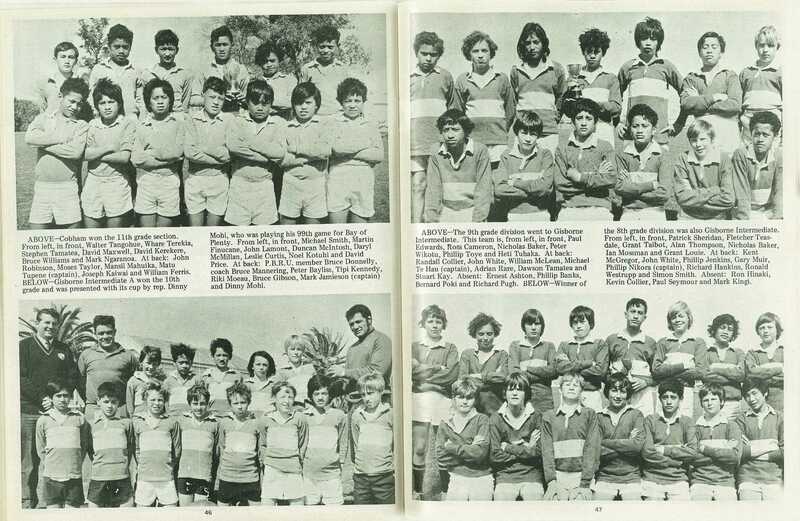 At back: P.B.R.U. 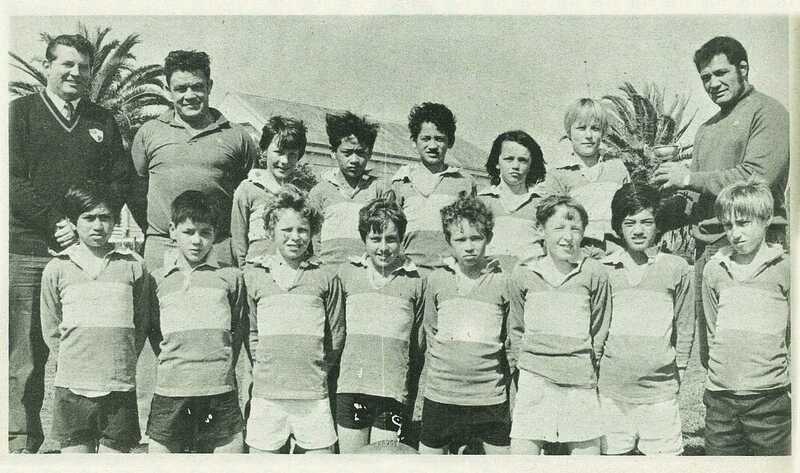 member Bruce Donnelly, coach Bruce Mannering, Peter Bayliss, Tipi Kennedy, Riki Moeau, Bruce Gibson, Mark Jamieson (captain) and Dinny Mohi. 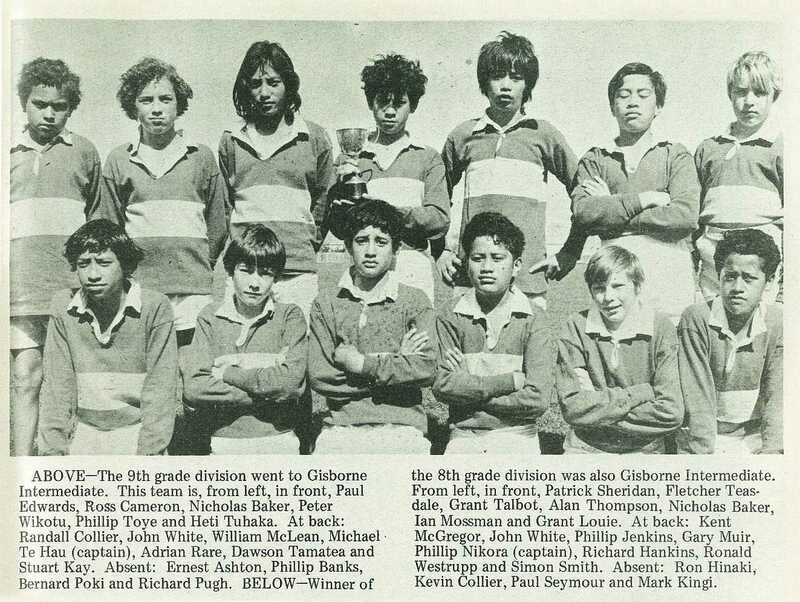 The 9th grade division went to Gisborne Intermediate. 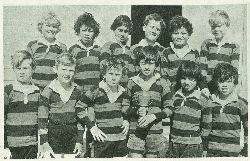 This team is, from left, in front, Paul Edwards, Ross Cameron, Nicholas Baker, Peter Wikotu, Phillip Toye and Heti Tuhaka. 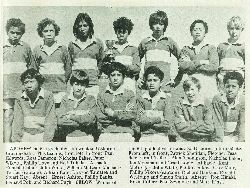 At back: Randall Collier, John White, William McLean, Michael Te Hau (captain), Adrian Rare, Dawson Tamatea and Stuart Kay. 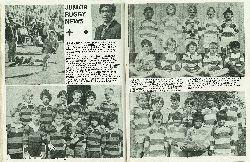 Absent: Ernest Ashton, Phillip Banks, Bernard Poki and Richard Pugh. Winner of the 8th grade division was also Gisborne Intermediate. From left, in front, Patrick Sheridan, Fletcher Teas-dale, Grant Talbot, Alan Thompson, Nicholas Baker, Ian Mossman and Grant Louie. 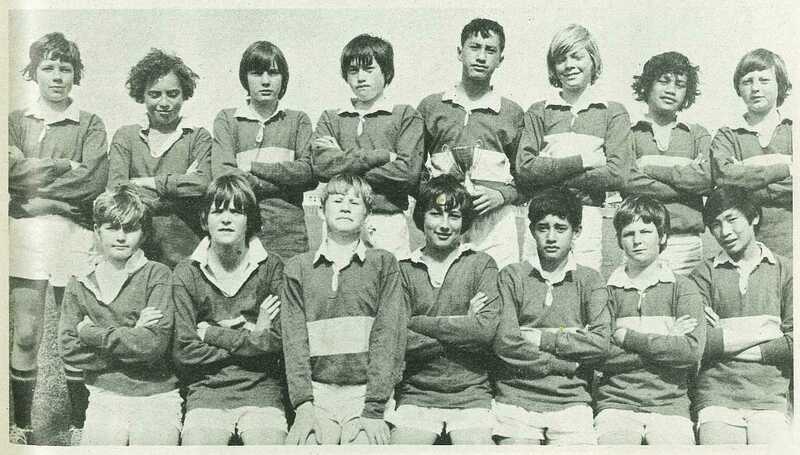 At back: Kent McGregor, John White, Phillip Jenkins, Gary Muir, Phillip Nikora (captain), Richard Hankins, Ronald Westrupp and Simon Smith. 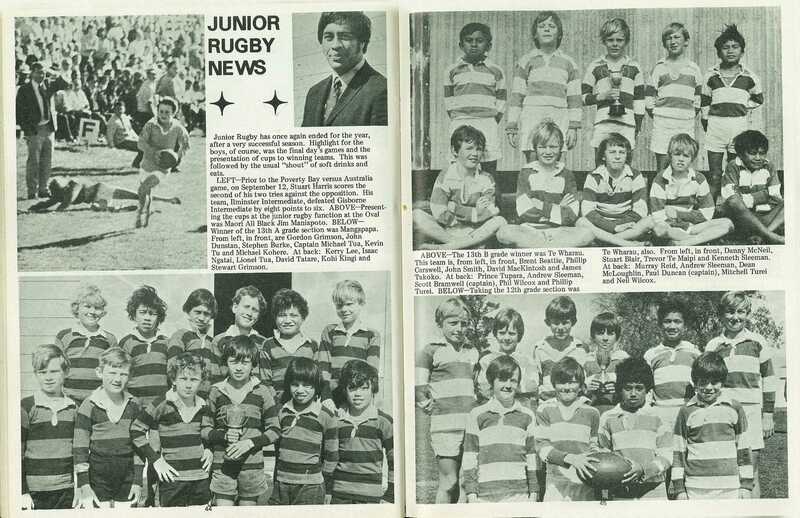 Absent: Ron Hinaki, Kevin Collier, Paul Seymour and Mark Kingi.